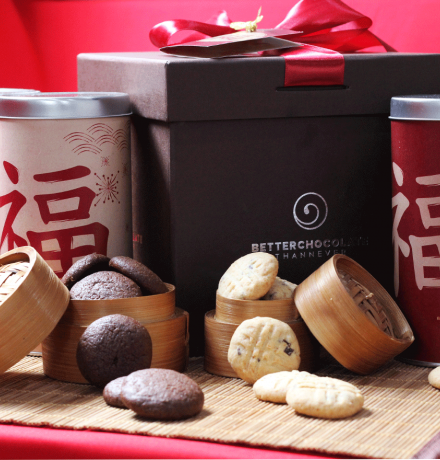 4 canisters of Double Dark cookies and Double Cheese cookies in a brown hard box + red ribbon + "FU" gift tag. Double Dark cookies: chocolate cookies made of 70% dark chocolate and filled with 60% dark chocolate chips. Double Cheese cookies: savory cookies made of two kind of cheese - edam and parmesan - and chunks of smoked beef. May this new year bring you a new balance in your life!